Dennis Brown has parted ways with the Somerset Trojans and has joined the Devonshire Cougars. Mr Brown guided the Somerset Trojans to the Premier Division last season, winning the First Division Title and Premier Development League Christmas Tournament. “I was definitely looking for a fresh challenge as I have been at Somerset as Head Coach for the past 8 years, so as an individual and coach I am always looking for new challenges to remain sharp and increase my learning,” said Mr Brown. Hmmm! At the end of the day it’s all about looking for new challenge$$$$$$$$$$$$$$$$$$$$$$$$$$! LOL at D Rock. His decision may be motivated by money, but so what?! Dennis is rooted in SCC and I can only imagine how hard of a decision that was. Congrats Dennis. I admire you as a coach and mentor and no matter where you end up, I will support you. Besides, I know you are still a TROJAN at heart! Sad to see you move on, but challenges are meant to be faced! Good Luck! Come on Ross, put up the actual stats (wins, losses, draws and goal difference). Also differentiate between domestic and international competition. Then we can start move beyond the kind of stuff that drunk guys swap while propping up the bar. Oh and you know what they say about drunk men speaking with sober tongue? Frankie – only someone that holds court in Captains would argue that those eight are not the top coaches in Bda…Could juggle the order from 2 – 4. And 6. -8 but for the most part the list is hard to argue against..
Ha ha there you are again Ross…you are very entertaining. I didn’t argue against your opinion I just asked if your opinion was supported by observable and objective criteria say like wins and losses. Seems like the answer is no….humour us (me) and put the stats up. Facts are quite simple and shared by most that have a clue about the game. I’m curious as to why you keep running back to two specific people/clubs that have no relevance to your point! If the “facts” are quite simple and widely shared how come you refuse to produce them? Whatever your issues, reading them play out is entertaining…. Cause you argued about those very same individuals previously when you spoke at length about the 2008 national youth team that drew with t&T. My bad to jump to the conclusion that you were either one and the same or championed their cause..
Sarcasm as in propping up the bar or the appropriate response,i.e sober tongue? Just asking. Or could it be the very, very generous joint 12th ranking? Like I said, the game is better now that those outside of the top 8 have left the coaching to those that have some ideas. Lets see if I can help you…with the possible exception of D Brown and S Goater, your list of 8 would best be classed as journey men who hopped from club to club, inheriting programmes and players as they skipped along. So again on what basis was your opinion formed? Bascome has won at every club that he has coached.. Note that BVCC were not on the map when he joined and the rest you can say is history. His record, knowledge and team’s style of play is enviable.. And he now has ROBIN HOOD in the top divison.. Hmmmm!!! I haven’t mentioned the youth teams that he has coached.. I rest!!! If he cut of his dreads, wore a suit and drove a 4X4 he would be Premier!!! Thompson has indeed jumped around and is a tad difficult to warm up to, however to question his ability and knowledge and the success he has had at the junior level, albeit less in senior football, is to truly highlight your lack of understanding of coaching..Like him/ hate him but you can’t deny that he is very talented.. I should also add that another method that can / should be used when judging coaches is the impact that those coaches have on players. There is no doubt that the coaches listed have played significant roles in the lives of our best players over the past decade and in some instances, longer. The converse is to consider those coaches, over the past 10 tears, that have been long term members of one team. The list is short and I hasten to add that I can’t point to one in this small group that could be considered good. At best average and if I am being candid ( which I am most times )the words lacking in ideas and basic would be appropriate to insert at this juncture…. What you failed to insert is that in addition to inheriting players, they improved them significantly. Further, you use the word journey man as if that is a bad thing and leads to less than stellar performances / success. Mourinho and Hiddink dispel that immature review of what makes a top coach. As does Bascome locally. At this level Andrew is a genius.. I hope this wasn’t all about the money, but anyways I wish coach Brown the best of luck. 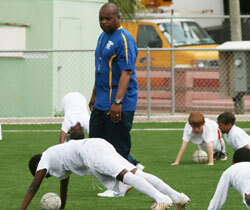 In my opinion, he is definitely one of the best coaches in Bermuda. By the way, big up Somerset Trojans!!! SCC all day!!! Welcome to the BIG CATS..Mr. Brown, I’m sure it will be a exciting change.